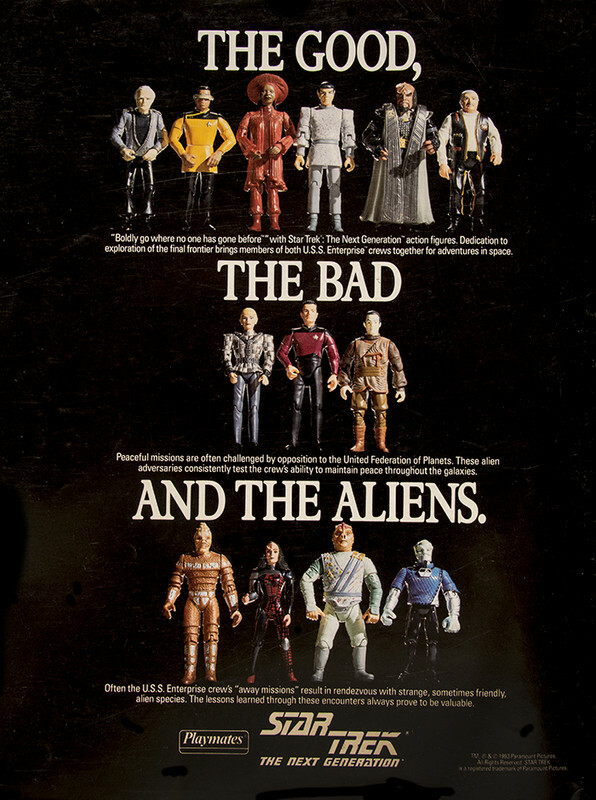 Here's one from 1993 advertising the second series of figures. Note the heavy emphasis here on TOS characters in the top row. Curiously enough, Scotty and McCoy were two of the most under-purchased figures on store shelves, by a huge margin. Were those overproduced? Playmates tended to underproduce the weird aliens, so Dathon and Vorgon were certainly produced in smaller numbers, but Lore was not. K'Ehleyr seemed to be harder to find, which often happened with female figures as a matter of course. 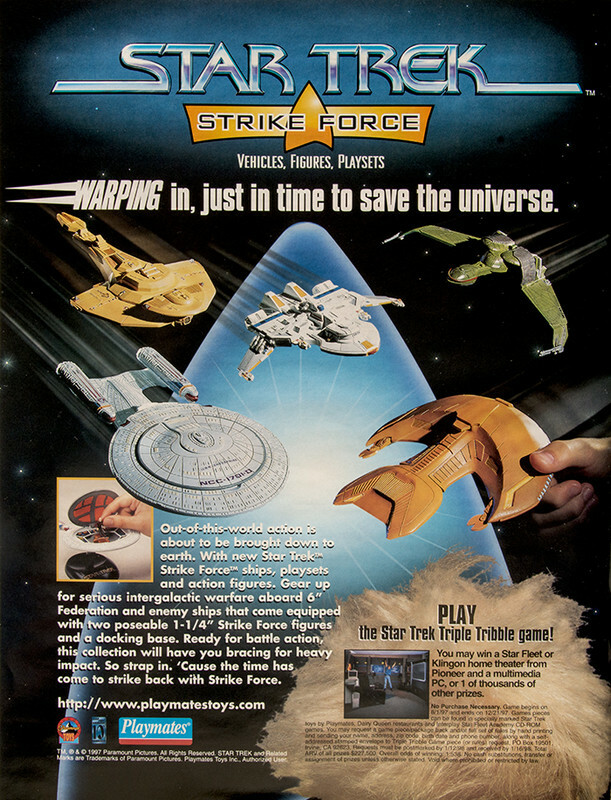 Despite an abundance of shuttle designs which you would think would be suitable for an Action Fleet-type lineup that Galoob had for Star Wars vehicles, Playmates centered on out-of-scale vehicles. Think of all the shuttles we could have had! The Spacedock shuttle, all the TNG shuttles, the TOS shuttle, various shuttlepods from TNG, a runabout... I mean, that's like 10 vehicles right there that could have been produced. And items like the Romulan Scout Ship could have been scaled down, etc. The Maquis ship was the only one that was sort of in the neighborhood of being to scale, in the same way that Tantive IV was in the neighborhood of being to scale with Action Fleet. Playmates figures and Ships in the 1990's we're a great time for me and collecting. I have many fond memories of them. I only have a few Playmates figures now on my shelf but I used to have nearly every one produced. Good memories. Taking us back! 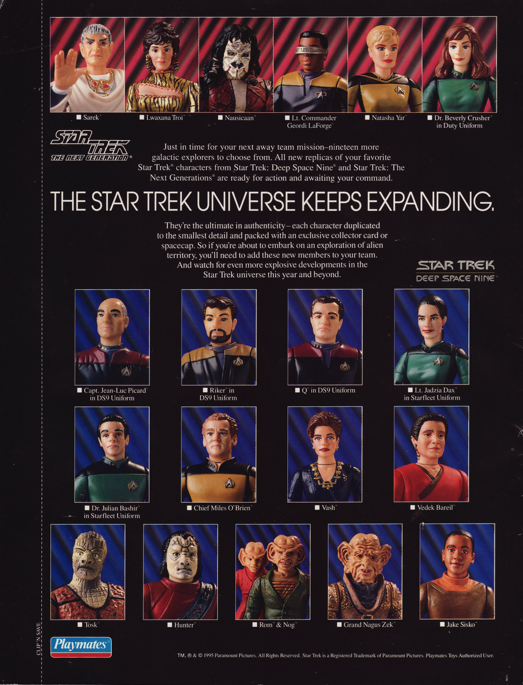 I loved all the ads in the Trek magazines and used to cut them out and keep them. I wanted to like the Strike Force but just couldn’t. They also had the Innerspace series which I begrudgingly collected. When I was in middle school I had my parents take me to the mall and I took that "Good, Bad, Aliens" ad to one of those places that prints t-shirts. I had them make a t-shirt with that ad on it. I loved it! And, yes as you can imagine I got teased a little in school for that, haha! One of the things I wished Galoob had made was a Spacedock playset large enough to display all the Federation Micro Machines they offered. I wanted a large spacedock as well, but I figured they couldn't make it happen in a realistic and economical way so that it would be less than like $40. With Galoob the thing that I was the most upset about was the lack of First Contact ships. It's only now in this decade that we're getting all these obscure and not obscure vessels with Eaglemoss and the other mfrs. They made a Death Star work but there was more demand for Star Wars even back then.